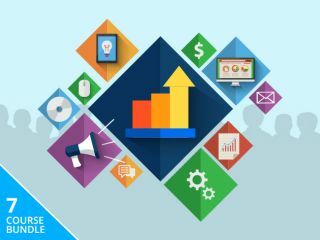 This seven-course bundle will teach you how to grow your user base. Harnessing the power of the internet is crucial for marketing your brand to potential customers. You can learn the tricks of the trade with the User Engagement & Marketing Bundle, available for the price you choose. Going viral isn’t just a matter of luck. The Growth Hack Bundle can help you get your product or service in front of an audience that will love it. Over the course of 21 hours of training, you’ll learn how to optimize everything about your website and grow your online presence beyond what you could have ever imagined. The Grow Hack Bundle is full of invaluable information, and you can pick the price you pay for it right now! Pay what you’d like for the bottommost two courses, or beat the average to unlock everything. No matter what, you’ll get incredible courses that will help you grow your business.